Working Women Wednesday is a weekly highlight of the hard-working women within the Girl Gang. This week’s feature is Owner of OY-L, Andrea Pierce-Naymon. Your Local Girl Gang: Tell us about your business. What is your mission statement? When did you launch? Andrea Pierce-Naymon: I started OY-L in 2016 with the mission to find a non-toxic yet luxury skincare that would be safe for my daughters and myself and for every other Mom who would be concerned about what they put on their bodies. I wanted to be a brand of “beauty without secrets” meaning that when you read the label, you knew what was in the product, not a bunch of chemicals you have no idea what they do or whether they were safe to use. YLGG: When and how did the idea for OY-L come to you? AP-N: When my youngest daughter was 16 she came down with an illness no doctor was able to diagnose. It took 2 years, many consults, a misdiagnosis before being diagnosed with POTS (postural orthostatic tachycardia syndrome). During this time I was sitting in the hospital during countless tests and admissions and wondering what it was that was making her sick. I started reading labels on everything from household products to cosmetics. I googled the words I didn’t know and was horrified by what I learned. Though my daughter’s illness was not a dermatological one, I started looking into natural cosmetics. Through much research and consulting with a cosmetic chemist, I came up with formulas that were safe and also effective. When I was interviewing companies to develop my website, I had 3 interviews with the one company I thought would do the best job. But by the third interview there was less interest and an uncomfortable meeting. The guy said, “in reality, I could build you a website and take your money, but my best advice would be to take that money and get rebranded!” Yikes, I was pissed! But what happened was that I did take his advice, worked with a Cleveland ad agency who refined my label, went to a beauty expo in New York and got tons of press because of the rebranding. It was a Saks Fifth Ave buyer that came to my booth and told me she loved my brand and 6 months later, I was selling on Sak’s website. The BEST advice, I ever got!! YLGG: What piece of advice you would give to women starting their own businesses? AP-N: It takes a village! Starting a company is not easy. You need support from family, friends and business professionals that want to help. You need a lawyer, accountant, marketing, reputable suppliers and employees. They all don’t work out at first, so know when it’s time to let go and find other support. Realize at first you are going to have to do everything from ordering, making product, throwing out the trash and mopping the floors. If you love what you are doing, even mopping the floors is exciting! AP-N: With my initial investment, I was able to secure space at the Akron Global Business Accelerator , now called Bounce Innovation Hub. It is the old BF Goodrich plant that has been revitalized. It houses many start-up companies from tech to medical to software companies. It is such a cool entrepreneurial space. AP-N: Besides my Starbucks, I could not go without my pets. I have two senior cats and a rescued French bulldog. They are so much fun and great stress relievers. They are also the reason, I wouldn’t use any products that are tested on animals. 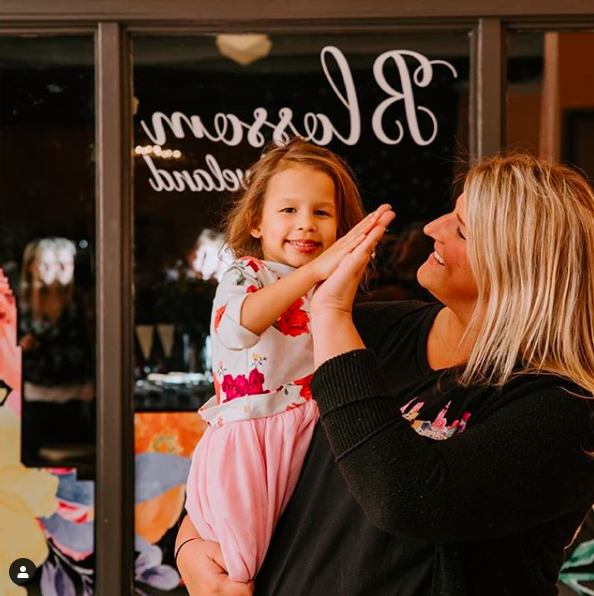 COME BACK EVERY WEDNESDAY FOR A NEW #WORKINGWOMENWEDNESDAY HIGHLIGHT TO LEARN MORE ABOUT THE BUSINESSES WHO MAKE UP THE GIRL GANG AND THEIR HARD-WORKING OWNERS. Working Women Wednesday is a weekly highlight of the hard-working women within the Girl Gang. This week’s feature is Maria Fitzgerald, Owner of Maria Fitnezz. Maria Fitzgerald: I help women feel confident and reach their health goals through my wellness habit tracking journals called “One Ray,” and my monthly Saturday morning wellness events! My mission is to make healthy living simple, sustainable, and enjoyable for all women, no matter their lifestyle! I launched 1 year ago as a certified personal trainer and have shifted visions to reach a larger clientele. MF: I began teaching Zumba/eating healthy in my teens and graduated college as a licensed physical therapist assistant in 2016. I started working in outpatient care, seeing many conditions that could have been managed through a little education of how to practice healthier habits. I became a certified personal trainer (through the National Academy of Sports Medicine) and decided to start a side hustle of coaching women on small changes they could make to improve not only their physical health, but also their confidence and happiness, as well. I share advice/tips that stay true to the “everything in moderation” concept. The main concepts include- eat more nutritious food, move your body each day, make sleep a priority, and do things that are good for your soul. Extreme doesn’t work for most people, but a little effort toward “true” self care can make a world of difference! MF: Keep going no matter what. If something doesn’t work, it’s okay to pivot and try something new! It sounds cliche, but I actually got my logo tattooed on my right wrist to serve as a daily reminder that this is my lifelong passion and I cannot give up, even it takes a lot of time and energy. MF: There are SO many qualities I admire including vision clarity, confidence, courage, and discipline, to name a few. Not only does she have to be a master at her talent, but she has to learn the ins and out of running a successful business that profits. Paving a new path means continuing forward despite the challenges and truly figuring it out as she goes. An entrepreneurial woman recognizes her full potential of changing the world and allows herself to fully embrace it. MF: I work from my laptop in my bedroom next to my sleeping dog the majority of the time for my wellness business, other than my monthly live wellness events which are in person. In addition, I work for an outpatient holistic private practice called “All Around Physical Therapy and Wellness” in Parma, OH. We have Himalayan salt lamps, plants, healthy snacks, and a relaxed environment to help patients heal. The PT clinic aligns perfectly with my side hustle mission. MF: Coffee! I love the taste and happy mood associated with the caffeine boost. I love the taste of my own pot at home, but my true drink of choice is Starbucks Pike blend with coconut milk, hot or iced. Working Women Wednesday is a weekly highlight of the hard-working women within the Girl Gang. This week’s feature is the Owner of AdvisHER, Brittan Leiser. Brittan Leiser: AdvisHer was launched in January of 2019. It is the Financial Resource for the Modern Woman. It is designed to serve as an empowering, educational, and less overwhelming way for women to learn about the wonderful world of personal finance. It is our hope that our content, courses, community, and counsel serve as the catalyst women need to feel more confident in joining the conversation so that they, too, can take ownership of their financial health. We know that talking about your finances can seem overwhelming, confusing, and even boring. The good news? We get it. We know women are unique, and we believe they deserve a different approach to thinking about and managing their financial lives. We offer financial consulting packages, financial planning, and investment services consistent with our approach that women deserve more, and should understand their options. BL: I launched AdvisHer in January 2019 after realizing that so many of my female clients had similar concerns and questions about their finances. These women all were smart, accomplished, and successful in their own ways, but felt completely intimidated when discussing anything relating to finance. I knew there had to be a better way to address this community in a way that better spoke to them. BL: As a kid, I always loved to write and also really enjoyed sports. In fact, at a young age, I entered my dad’s workplace March Madness pool and came in second out of 50 entries. I was raised to love all Cleveland sports teams and also dutifully supported the Notre Dame Fighting Irish. Throughout grade school and high school, I dreamt of being a sports writer or sports broadcaster. I studied the works of strong journalists and even got into Northwestern’s Medill School of Journalism! However, perhaps stronger than my love of writing was my love and passion for the University of Notre Dame. Attending the school was a lifelong dream, so when I received my acceptance letter, I abandoned all thoughts of journalism school and decided to trust the path I was on and see where that would lead me. I feel that regardless of what industry you’re in, this sentiment really holds. In today’s day and age where everyone is so busy and always moving on to the next thing, doing business can feel so impersonal. I believe that now, more than potentially ever, it’s so important to build lasting relationships and bring the personal element back into the business dynamic. In the financial industry especially, establishing a strong working relationship with our clients that is based on trust, transparency, and integrity is so important. Ultimately, I’ve found that clients don’t care much about what we have to say unless they know how much we care. I strive daily to demonstrate our passion and commitment to our clients so that they feel they’re important and that they matter. BL: I admire resiliency. The life of an entrepreneur is a busy, crazy, and demanding one, but it is very worth it. I have always admired women with incredible drive and work ethic, and those two characteristics are critical to success as an entrepreneur. However, most importantly, I admire the ability to try, learn from mistakes, and never give up. BL: As an entrepreneur, you have to be your own best cheerleader. There are times when you might be the only one who believes in the true nature of your idea and what you’re doing. You have to believe in yourself and know yourself well enough to ignore the distractions and do whatever it takes to turn your dreams into a reality. BL: I’m fortunate to start nearly all of my mornings with a little dance party with my 15-month old son. He’s an early riser and generally serves as my alarm clock. He loves to jump around and dance so, typically, after I’ve removed him from his crib and change him out of his pajamas, we throw on some music and jump around. He honestly loves this, and I can’t think of a better way to start my day….except, maybe, to include a hot cup of coffee too because #momlife. BL: I really and truly would love to have lunch with Eleanor Roosevelt. I just think she was a lovely lady: so smart, passionate about her beliefs, and committed to making this world a better place. She was well-respected, and for good reason. Perhaps my favorite quote of hers is that “No one can make you feel inferior without your consent.” I really love this idea that while we cannot always control what others think of us or say, we can control how they make us feel, and that we are the true decision makers of our lives. Working Women Wednesday is a weekly highlight of the hard-working women within the Girl Gang. This week’s feature is Tiwanna Williams, Owner of PearlFlower Catering. Your Local Girl Gang: Tell us about PearlFlower Catering. What is your mission? When did you launch your business? Tiwanna Williams: Our mission at PearlFlower Catering is to create quality food that excites, deliver excellent service that enhances and provide memorable experiences for our clients. YLGG: When and how did the idea for PearlFlower come to you? TW: I’ve loved to eat and cook good food since I was a little girl! The inspiration for PearlFlower came from my two grandmothers, Pearline Scott and Delores Flowers. Grandma Pearline taught me how to cook, and Granny Flowers owned her own business for over 40 years. TW: Growing up, I actually wanted to be a dentist! TW: Don’t allow your talent to take you where your character can't keep you . . . integrity is everything! YLGG: What piece of advice would you give to women starting their own business? TW: Negotiate . . . Men do it all the time! TW: My workspace is my kitchen . . . a canvas to create . . . Food is ART! YLGG: Name an entrepreneurial woman, past or present, who you admire. TW: Delores Flowers - Her work ethic and commitment to quality. Oprah Winfrey - Her work and success is universal. Her work has transcended gender and racial boundaries. Catheryn Greene (Cathy’s Gourmet Ice Cream) - Her fearlessness and operational systems organization. Mercedes Perez (Fraternal Healthcare) - Her ability to delegate and lead. Working Women Wednesday is a weekly highlight of the hard-working women within the Girl Gang. This week’s feature is Megan Robinson, Owner of Blossom Cleveland. Megan Robinson with her daughter, Blossom, who inspired her store! Your Local Girl Gang: Tell us about Blossom Cleveland. What is your mission statement? When did you launch your business? Megan Robinson: We launched Blossom in March of 2018 and just opened up our first storefront in Lakewood in January. Our entire mission is happiness. Flowers make people happy. Doing something small (like gifting flowers to a friend or treating yourself) can have a positive effect on your mental health in a huge way. YLGG: When and how did the idea for Blossom come to you? MR: I was working in real estate and I was completely aching to release the creative side of me. I wanted to do something that brought me, and residually others, joy. I remembered the sense of peace I had when I did my own wedding flowers (I don’t recommend that, by the way,) and just jumped in head first. Our daughter’s name is Blossom so, obviously, we named the business after her. MR: It’s kinda funny because I do work that was my “dream job” as a kid. I always imagined myself as this powerhouse of a woman wearing a suit to work and making important decisions and I worked super hard and overcame so, so, SO, much to be at the place I am now. I don’t talk about it often because for a while, I was afraid that people wouldn’t think I was good at one craft or the other if I was doing a lot. I am the Property Manager at a large office building downtown and I also actively sell residential real estate. Anyway, once I reached that point, I realized that I hate dressing up for work. MR: I love when women compliment and build one another up and really, really mean it. There’s nothing like meeting another entrepreneur who is absolutely killing it and instead of making you feel insecure, she is encouraging and down to earth. MR: Just do it. You will NEVER have enough time or money, and someone is always going to doubt you. Do YOU know you can do it? Good- now go do it. MR: Everything. Seriously, I had a vision in my head of a great place to meet up with friends, hang out, take photos for your IG feed, and build yourself something beautiful and I’m really proud of how it came together. I didn’t hire an architect or designer to do it; I wrote down my ideas on post-it notes, called my husband and mom and grandparents to come help me, and we roughed it out. MR: Prayer. It’s so easy to be anxious in a world of social media and finances and high highs and low lows but, for me, nothing is ever that serious because I serve a bigger purpose.